If anyone out there has seen the film The Princess Bride, then you should know why I picked up the book version. It is one of my absolute favourite films and so damn quotable. So obviously when I saw the book on sale, I couldn't help but pick it up and partake in that bittersweet exercise of comparing the book and the movie. To do otherwise would be inconceivable. As a small boy, William Goldman learned to love literature after his father read him the story of The Princess Bride by S. Morgenstern, an epic tale of swordplay, revenge and true love. When he tries to pass on this love to his son, however, he finds that his father may have trimmed the novel down to "the good parts", sparing him countless pages of tedious satire. As such, he decides to abridge the novel, presenting the novel to the reader as it was read to him, with copious abridging notes along the way. 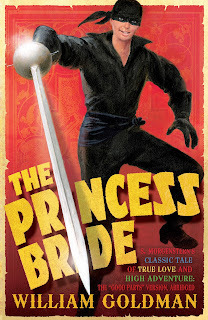 There was probably a part of me that knew that this was coming, but The Princess Bride was better as a movie. While I was very much a fan of some of the additional details, like Inigo and Fezzik's back-stories, I found that the majority of these details worked more to bog the narrative down. Take the asides by Goldman as part of the abridging work. The ones that work the best are the ones that he keeps short, sweet and to the point. Because when they don't, the narrative can take a turn for the overly clever or, more often, self-satisfied and mean-spirited. Honestly, that's the most disappointing part. What should be interesting to a reader, expanding what we know about characters that you loved from the film version, is ruined because the things that were mere niggles in the film are now amplified. Buttercup's lack of common sense is now stupidity to the point that the reader is in danger of completely missing what Westley sees in her other than her beauty. Westley's controlling behaviour is likewise made uncomfortable with such lines as "Woman, you are the property of the Dread Pirate Roberts and you do what you're told!" pushing his character neatly over the line into the list of characters most likely to commit mariticide at some point after the story's end. At the end of the day though, the film was an uncannily faithful adaptation, all things considered, so fans of the film should still enjoy themselves.